The Admirable Peasants March is on its way Caracas to talk with President Maduro about their agricultural hardships caused by imperialist economic warfare. 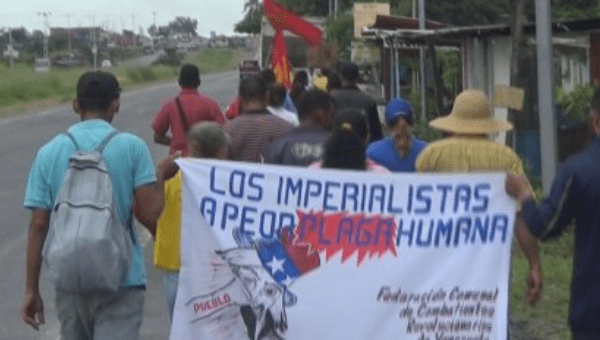 July 23 (teleSUR) The Admirable Peasants March is marching across Venezuela to Caracas hoping to meet with President Nicolas Maduro to let the leader know the serious problems that this sector suffers. Oswaldo Mena, agricultural secretary of the Communist Party in the state of Portuguesa told ALBA TV, “We are going to raise all our problems to the Miraflores Palace in Caracas,” saying that the objective of the mobilization is to find a solution to the problems of the peasants, which affects the food supply to the Venezuelan people.” Mena said this is the main purpose of the march “as the oligarchy is waging an economic war,” he added. The march, which began nearly two weeks ago is traveling from the rural interior parts of the country to coastal Caracas. Along the way, the Peasants March has been meeting with political parties and other grassroots organizations such as Classist Peasant Current Nicomedes Abreu, the Popular Front for Popular Work in the Field, the Presidential Peasant Council and the Communal Federation of Revolutionary Combatants of Venezuela. “We have a lot of optimism (for the meeting) and although this is a lot of effort, we will not faint but move on,” march leader, Arbonio Ortega told ALBA TV. The spokesmen of the peasant movement said they are deeply supportive of President Maduro and their march. Caravaners said they want to defend land rights, peasant women rights, agri-food sovereignty, and are against government opposition.